Learn about how it would be impossible to formulate and solve real-world problems without algebraic notation. 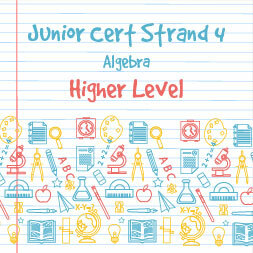 Algebra is one of the strands of the new Project Maths Course in the Irish curriculum. It is the lifeblood and the natural language of Mathematics and provides a perfect link between number, geometry, trigonometry and functions. It would be impossible to formulate and solve real-world problems without algebraic notation. Students are first introduced to representing numbers with letters and then they are taught how to convert problems into algebraic equations which can be solved by means of well-known techniques. Students are taught how to solve simultaneous, quadratic and cubic equations and then extend their knowledge to the solution of inequalities. Searching for roots by trial and error and the use of synthetic division is also covered in this strand. - Solutions of Linear Inequalities.